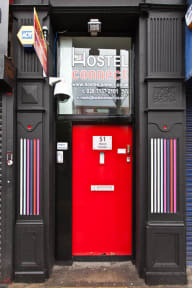 Hostel Connect is Derry City's Largest Hostel and can accommodate up to 64 people in both dorms and private rooms. It is situated in the heart of this Historic Walled City, which played host to the City of Culture 2013, and only 2 minutes from all the action of the pubs, clubs, restaurants and the vibrant night life of this fantastic city. Hostel Connect is funky, chilled out and will appeal to all types of travelers, young and older alike. Hostel Connect is located on the Strand Road, the main through fare and bus route of the city. We are literally 2 -5 minutes from the famous historic walls dating back to 1601; the Bogside area which is home to the famous Bogside Murals and the tragic and controversial Bloody Sunday conflict of 1972; and Waterloo Square where many of bars are located. We have 10 bedrooms consisting of two large mixed dorms; a 9 bed dorm, one 6 bed female only dorm; one 6 bed mixed dorm; one private family room (double and triple bunk) and three private double rooms (double bed); and one twin room (two single beds). Each room is named after the funky colour that it has been painted! We have lovingly brought back the original wooden floors throughout most of the hostel adding a great ambience. The hostel also boasts and huge common room where you can chill and hang out on sofas and watch TV or movies on our large screen TV. We have specifically located this on the top floor and in its own wing of the building, so you won't be disturbed or won't disturb other guests. We plan to have plenty of music nights and pub crawls to keep you occupied as well! The hostel also has a good size kitchen and dining area (open 7am -10:30pm) on the first floor. There are 6 separate shower rooms (electric so you'll never run out of hot water), 3 on each floor. We offer a free continental breakfast with each night stay, free wifi throughout the hostel and smiles are always free. 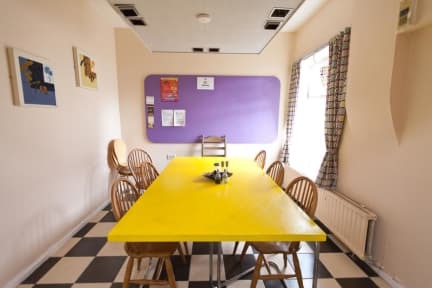 Our aim at Hostel Connect is to provide budget-orientated sociable accommodation where guests can stay and enjoy the 'craic' in Derry, in a safe, clean and fun environment. Got a large room and ample facilities. We only stayed one night but thought it was a great hostel. Fresh fruit with breakfast was a treat. Good hostel, verry kindley staf. Breakfast was good. Only I had a room with 6 bed. And between the beds are not So much spays. Good location, creative vibe. Kitchen could use more utensils. Triple bunckbeds are a bit weird, but I slept allright. Met some nice people. Doors open with codes, lockers in room. Derry has great history and is worth a visit.